Utilize your skills developed from years of Mad Libs and create a cute story featuring the Doko Demo Issyo cast. Chances are you can’t remember your early childhood. Unless you currently are in early childhood, then you probably vividly recall the mass of small books your parents bought for you on a shopping binge at Borders and now rest in your bedroom. These books are simple: not big on words, nor big on big words, but they are pretty damned entertaining, aren’t they?! And they’ll no doubt hold a special place in your heart for the rest of your life. Probably. It’s no different in Japan. In fact, since Japan is one of those countries with a strict ethos of taking something Americans regard fleetingly and turning it into a big deal, it was only natural to tackle children’s picture books (known as ehon over there and for most of this preview) and turn them into expensive video games. However, today’s featured game is not a pioneer. After all, during the heady "multimedia" days of the mid 90s you’d be hard pressed not to find a computerized children’s book sitting on the shelves. And even as recently as last year has a whole "Digital Ehon" series popped up on the PS one. Ah, but those aren’t real games! Yes, as shocking as it sounds, the Digital Ehon series is really nothing but a series of Flash animations ported to a console. As for the rest, well, we’re all too familiar with the 3DO library by now. Okay, so enough filler. Coming off the rush of Toro to Kyujitsu, Sony has already reenlisted its adorable cat-thing Toro and his animal friends (marketing term: Pokepi) from Doko Demo Issyo, the timeless PocketStation-based game. 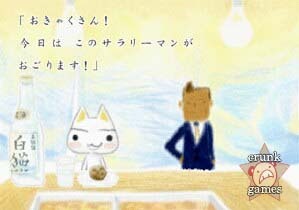 Now they’re starring in Watashi na Ehon (My Picture Book), a new approach to virtual baby books. And with the market hurting so, it’s about time. You begin Watashi na Ehon in a store that sells, uh, ehon. The owner of the store invites you to create a book with him and with you now totally enthralled, the two of you begin. The purpose of playing is to build a story based on your input. Start by choosing one of the Pokepi (Toro! Ricky! Suzuki! Pierre! Jyun! ), who then become the main character of your particular little project. From there the story begins to unfold, and at times you will be prompted to make choices to branch off the story. Part of that is inputting words and phrases that will be established in a custom dictionary. As the tale goes on, the word(s) will be continuously used and produce varying results among the plot and the characters in the story too. This kind of "tell me what to do" device is a staple of the Doko Demo series, and in Ehon can lead to a cheerful story or a somber one depending on the choices you make. Aside from words, you may also have to select from a series of pictoral items to keep things moving.